Thai schools reached the global standard for environmental education. 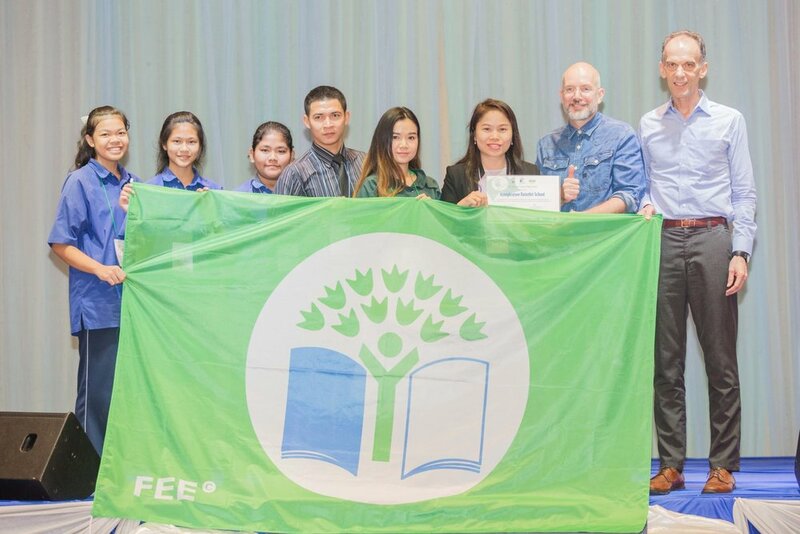 WWF-Thailand, together with the partner, IKEA Thailand, hosted Eco-Schools Award granting ceremony and presented the prizes to the schools operating 2018 Global Environmental Education. This year, there are 3 schools, recognized for excellence in environmental education, receiving the Eco-Schools Green Flag Award including Klongratumratutit School, Rattanakosin Sompotch Bang Khen School, and Ritthinarongron School amongst 21 schools nationwide that have joined the programme. Mr Gordon Congdon, Conservation Program Manager of WWF-Thailand, stated about the success of Eco-Schools: “This is the second year that WWF-Thailand represents the Foundation for Environmental Education (FEE) to operate Eco-Schools programme in Thailand. And this year, there are 3 schools recognized for excellence in environmental education and receiving the Eco-Schools Green Flag Award, which shows their progress in environmental management. Most of all, the students leading the program can also practice project management skill to prepare to be responsible and protect our world’s natural resources and environment in the future. We have to say thank you to Office of the Private Education Commission (OPEC) for credible judgment and we want to express our gratitude to IKEA for the continue support, giving children a chance for joining Eco-Schools programme”. Mr Lars Svensson, Sustainability & Communication Director, IKEA Southeast Asia, stated: “Apart from the schools receiving the Eco-Schools Green Flag Award, it is a pleasure that many other schools were also recognized the Silver Award and Bronze Award, reflecting their potential in environmental education. We are proud to support Eco-Schools program for the second year, following IKEA’s goal encouraging sustainable consumption and environmental responsibility”. Ms Sutthawee Laowkae, a student from Rattanakosin Sompotch Bang Khen School, which was recognized to achieve Green Flag Award said: “At first, it was not easy. The problem of garbage is close to us but we have to be creative to solve it and to persuade all students to cooperate. In our school, we always inform about the benefits of waste management and waste segregation; we launch games to motivate all students. Moreover, our teachers help us to inform this issue like my teacher in Art & Music class that composed a new song to raise awareness of the student about waste segregation. The success is our pride; now we know we can do it and we will maintain it for long. FEE awarded 3 schools the Green Flag for their commitment towards improving their school environment. 10 schools were granted the Silver Award by WWf-Thailand while 4 schools received the Bronze Award. Eco-Schools is an environmental education programme for sustainable environmental management in a school. It is present in 67 country and more than 50,000 schools around the world. WWF-Thailand joined FEE and is Eco-Schools Program National Operator since 2016. Currently, there are 21 schools implementing the programme in Bangkok, Samut Prakarn, Nonthaburi and Phuket.